[the EU proposed a law banning] jugs and dishes of olive oil in restaurants. From January next year, dishes of oil are to be replaced by bottles, which must be presented, claret-like, at the table with a tamper-proof nozzle and EU-approved labeling. The law intended to “protect customers and improve hygiene,” which seems strange, as the article notes. Few of us imagine that we need protection from olive oil on plates. Thanks to the internet generating massive blowback, the EU withdrew the law. What bothered me about their withdrawl, however, was that they did not seem to think that the idea itself was bad, merely their technique of presenting it. Agricultural Commissioner Dacian Ciolos commented that, “the law was not formulated in a way designed to draw widespread support.” I suppose they may try again another time. Many of the objections to the law centered around the burden it placed on smaller independent producers and smaller cafe’s and restaurants. Progressives like to use government to aid the “little guy,” but some regulation does the opposite. Big companies can much more easily absorb the costs of regulation than smaller ones. Some regulation serves a public good. I do not believe that the “invisible hand of the market” should determine all things. As Philip Bobbitt argued in Tragic Choices, a purely unregulated market is another way of saying, “We take no responsibility as a society for our actions.” Pure capitalism can descend into a kind of fatalism. That said, I do think that regulation can easily damage society in subtle and hidden ways. When regulation goes too far it limits freedom, and in this way, too much government can bring down a civilization. Of course we need some government action to have any freedom at all. An anarchic state enslaves everyone to the power of the strongest. We romanticize the wild West, but who wants to have to carry around a gun to ensure our own personal security? Government needs to have a near monopoly on the use of force so that we can all go about our business in peace. “What’s next? I really don’t see the rationale. The whole contract between restaurant and customer is based on trust. If someone’s going to break it, they’re going to break it. No one says you need to show the pack of flour that the bread came from, so why the oil?” (emphasis mine). It took Gibbon six volumes to describe the decline and fall of the Roman Empire, so I shan’t embark on that. But thinking about this almost incredible episode does tell one something about the nature of civilisation. It shows that however complex and solid it seems, it is actually quite fragile. It can be destroyed. Well, first of all fear — fear of war, fear of invasion, fear of plague and famine, that make it simply not worthwhile constructing things, or planting trees or even planning next year’s crops. And fear of the supernatural, which means that you daren’t question anything or change anything. The late antique world was full of meaningless rituals and mystery religions, that destroyed self-confidence. And then exhaustion, the feeling of hopelessness which can overtake people even with a high degree of material prosperity. There is a poem by the modern Greek poet, Cavafy, in which he imagines the people of an antique town like Alexandria waiting every day for the barbarians to come and sack the city. Finally the barbarians move off somewhere else and the city is saved; but the people are disappointed — it would have been better than nothing. Of course, civilisation requires a modicum of material prosperity. What civilization really needs [is] confidence in the society in which one lives, belief in its philosophy, belief in its laws, and confidence in one’s own mental powers. 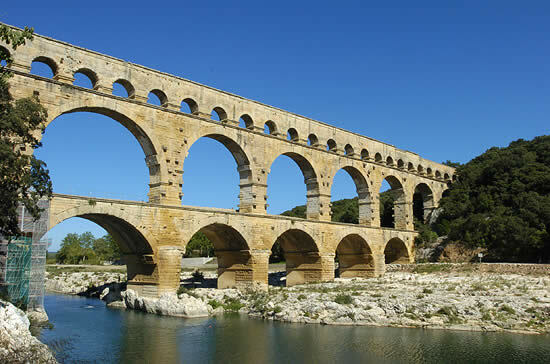 The way in which the stones of the Pont du Gard are laid is not only a triumph of technical skill, but shows a vigorous belief in law and discipline. Vigour, energy, vitality: all the civilisations—or civilising epochs—have had a weight of energy behind them. The presence of “mystery religions” might seem far removed from over-regulation, but both have a “this is pointless, absurd, disconnected from real life” quality to them, and both can confuse and exhaust those subject to them. Silly regulations reduce trust in our institutions. This sense of confusion and despair produces a lethargy that saps a civilization of creative freedom. In a previous part of this study we have seen that in the process of growth the several growing civilizations become differentiated from one another. We shall now find that, conversely, the qualitative effect of the standardization process is decline. He goes on to argue that standardization makes society rigid, and in so doing, prevents creative responses to challenges we face. The “Dominant Minorities” that do so much damage can take the form of snobby aristocrats, or even wide-eyed, well intentioned bureaucrats. Civilization needs some kind of standardization to allow for people to interact productively with others both within and without their respective civilizations. Some degree of unity, then, helps civilization to flourish. But it becomes all too easy to run too far with that impulse, and at some point the line gets crossed. Standardization eliminates individual or local initiative. I have heard from public school teachers, for example, who argue that the rise of standardized testing has not only proscribed what to teach, but how to teach. Busy governments can fool themselves into thinking that because things may be orderly, that things are well. They may forget that civilizations are not sustained primarily through government action, but through the connections made by people in their communities — connections with their neighbors, their schools, etc. Foolish regulation puts up barriers to the trust that is essential between people. We no longer directly trust our doctor, we trust the program. This “top-down” approach to governance creates whitewashed tombs that can collapse almost instantaneously under the right conditions, a la Soviet Russia. Governments can, as C.S. Lewis points out, easily get confused. Many conservatives often state that government programs threaten freedom. As a blanket statement, this makes no sense. Think of how our system of roads, and their regular maintenance, enhance our freedom of movement. But as a general rule it has a kernel of truth, at least in our day. The impact of improper regulation will not be direct or immediately felt, but in working against freedom of initiative and bonds of trust, it erodes civilizations from the inside out. These concepts do not tell us exactly what to do in every case, but I do think that if we agree with Clark, Toynbee and the restaurant owner, we should have a “presumed guilty” bias against regulation in developed societies. Some regulations will and should pass the test of examination, but many others should not. I think Joseph Tainter would have agreed with Clark and Toynbee as well.